These cranberry meatballs are always a favorite. The cranberry sauce in the sauce mixture adds tangy flavor with a hint of fruitiness, but it doesn't overpower. Try adding chunks of pineapple to the sauce for some extra flavor and texture. Many like the texture of whole cranberry sauce, but jellied is just fine if you prefer a smoother sauce. Take the meatballs along to a potluck or tailgating party and serve from the slow cooker. They are sure to be a big hit. Provide small plates, napkins, and toothpicks to make serving a breeze. These meatballs are made with all ground beef, but you may add 1/2 pound of ground pork to the mixture. The recipe is easily scaled up for a crowd. In a large bowl, combine the ground beef, cornflake crumbs, parsley, eggs, ketchup, onion, soy sauce, garlic powder, and pepper. Mix well and form into small balls, from 1/2 to 3/4-inch in diameter. Place the meatballs in a casserole dish or baking pan. Meanwhile, in a saucepan, combine cranberry sauce, chili sauce, brown sugar, and lemon juice. Cook over medium heat while stirring until smooth. Pour the hot sauce over meatballs in casserole. If desired, add one 8-ounce can of pineapple chunks (drained). Bake for 30 to 45 minutes, depending on the size of the meatballs. Transfer to the slow cooker and keep on low for serving. Chili sauce (not Asian) is found near the ketchup in most grocery stores. Heinz is a common brand. For a super easy appetizer, add the sauce ingredients to the slow cooker. Stir to blend thoroughly. Add your favorite brand of frozen meatballs. Cover and cook on HIGH for about 3 to 4 hours. Until the meatballs are hot (above 165 F). Set the slow cooker on low for serving. 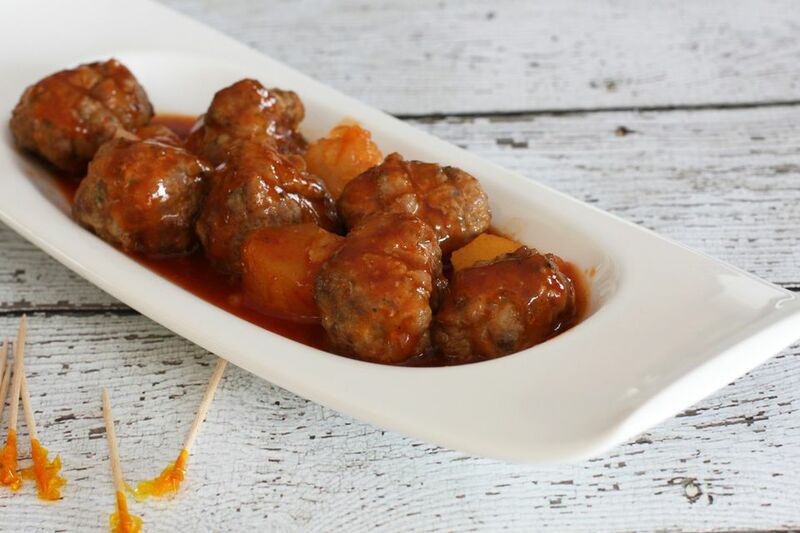 To cook on the stovetop, combine the sauce mixture in a large saucepan and add the frozen meatballs. Cover and cook for about 15 to 20 minutes, or until the meatballs are hot.